Living on Fisher Island off the coast of Downtown Miami is unlike an other luxury living experience in South Florida. Fisher Island luxury condos are seldom available, but now you’ll have the opportunity to own your very own island paradise at Bayview. 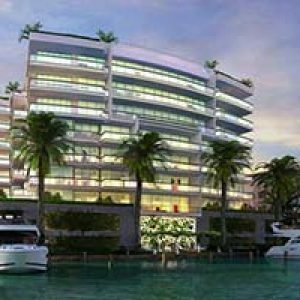 Bayview luxury residences provide the serenity and seclusion you deserve while still being just a short boat ride from all of Miami’s finest attractions and amenities, not to mention the the five star amenities available in your very own community. This self contained community on the Northwest corner of Fisher Island offers spectacular views of the Atlantic Ocean, Downtown Miami, and the beautiful Biscayne Bay. Two, three, four, and five bedroom units are currently available at Bayview in a wide range of prices and floor plans. Two bedroom, 1,950 square foot units start at just $4.3M, while five bedroom 6,470 square foot penthouses sell for $13.2M. This series of old-world style buildings directly on the water stand out even among the countless luxury residences on Fisher Island. Floor space is the staple of luxury living at Bayview. Open flow-through floor plans maximize space and give you the room you need to relax or entertain guests. Enormous outdoor terraces maximize the natural beauty of the island and are complemented with expansive ceilings and marble or hardwood flooring. Kitchens come equipped with top of the line appliances and cooking areas fit for a gourmet chef. In addition to the natural beauty of your luxury residence at Bayview, all community members may enjoy the enclosed community living on Fisher Island with the very best in luxury amenities. The Links, a P.B. Dye designed nine-hole golf course is just steps from your doorstep. The Fisher Island Hotel & Resort is home to some of Miami’s most acclaimed restaurants and spas. Park your yacht at the Marina & Yachting Center with up to 131 slips capable of docking large to small vessels. Play a few games or spectate at the Grand Slam Tennis center, complete with 18 professional courts of clay, grass, or hard surface. Twenty four hour transportation is available to the mainland via ferry, helicopter, seaplane, or yacht. All residents at Bayview are free to enjoy the pool facilities and The Beach Club at The Mansion, a frequent hangout for stars and celebrities. While the isolation of a luxury residence at Bayview on Fisher Island is one of its best features, you will still be in close proximity to the very best in Miami dining, entertainment, nightlife, and culture. Some of Miami’s best restaurants like Cafe Porto Cervo, La Trattoria, Sunset Bar, and others are located right on Fisher Island. Luxury residences on Fisher Island don’t come along very often, don’t miss out on your opportunity to own a piece of tropical paradise just a stone’s throw from Downtown Miami!